When you link your YouTube channel to a Google+ Page, the YouTube channel is moved from it's original Google account to the Google+ Page's special subsidiary Google account. You can switch between your different YouTube accounts after signing in, but if you use third party video editing software like iMovie or Premiere, live video broadcasting tools like Wirecast, or some mobile applications or game consoles to access your YouTube channel, you may run into a problem. Many of those third party applications and devices are unable to switch between YouTube channels. 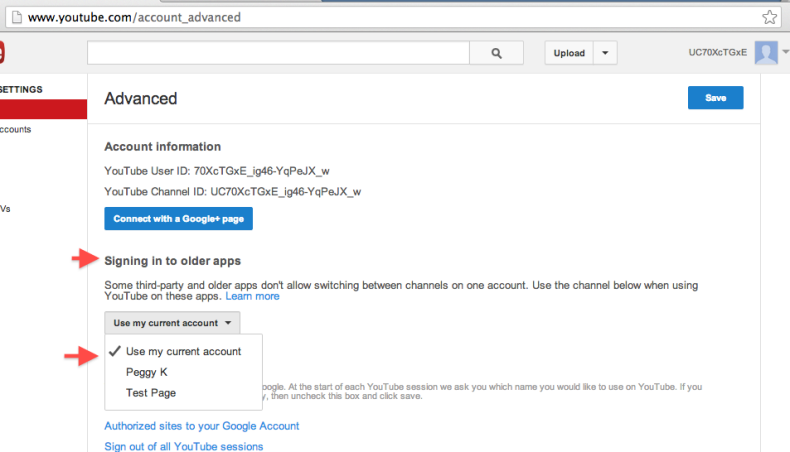 What means is that you need to set the default channel for those apps in your YouTube account. 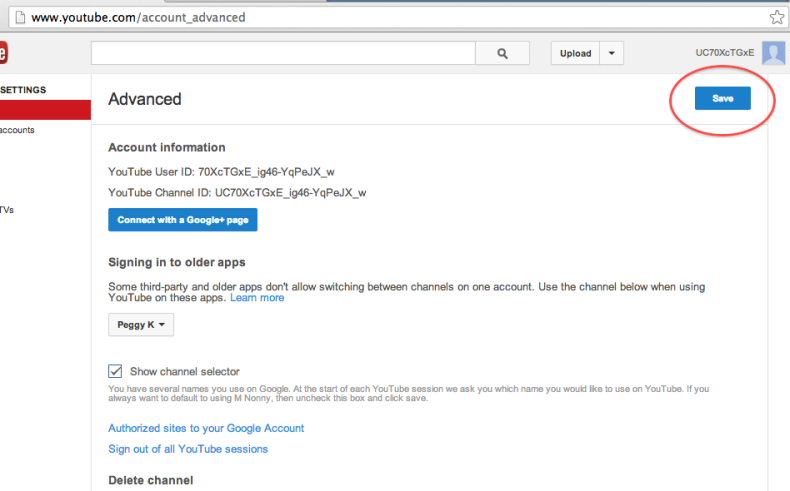 Note that this will not set the default channel when you sign in to YouTube. If you do not want to have to switch between your personal Google+ Profile identity and a Google+ Page-connected YouTube channel, you can instead set a password for your Google+ Page. How do you set the default channel for your account for third party applications and sites? • Click "Signing into older apps" and choose which channel you would like to set as the default. • When you've made your selection, click the blue Save button at the top of the page. • You should see a confirmation that your selection has been saved. How can I set my Google+ Page as the default when I sign into YouTube? 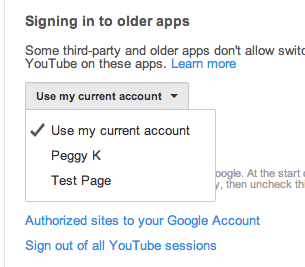 If you would like have different 3rd party apps sign into different channels, or would prefer that your Google+ Page-connected channel the default when you sign in to YouTube, you can set a password for your Google+ Page. You can then use that password to sign into your Google+ Page-linked YouTube channel directly. YouTube Help: Use 3rd party devices, apps or tools with channels linked to Google+ Pages. I've been trying to do this but the "signing into older apps" option is no longer available. Do you know how this could be done without this option? Hi Nina. I just checked my account and I still see that option, so I'm not sure why you don't see it. You have to be sure that after signing in to YouTube, you are switched to your email/personal Google+ Profile identity when you go to your channel's advanced settings. Are you sure you are using that identity on YouTube? I'm having the same problem as Nina. I can't find the "signing into older apps" button anywhere. Sign in with primary Channel Google Account.. and you can see it..
Selphani: are you sure you are using YouTube with your personal Google+ profile /Email identity when you go to www.youtube.com/account_advanced? You should see a heading "signing in to older apps" with a drop down menu below it with your channels listed. You need to be signed into your GOOGLE account name. If you're signed in under your YOUTUBE account name, you won't see it. Casey: that's right. You need to be switched to your Google+ Profile/email name. Just to clarify for anyone, don't log into the youtube channel you want to change to your default, log into your current default and the option will be there to switch to your other channel connected to the same google email. I'm trying to set up my 2nd channel as my main channel, anyone can help? System redirects me to my "own" channel that I do not use, and do not want, any ideeas? Currently there is a problem on YouTube where you may get unexpectedly switched from a Google+ Page channel identity to your Google+ Profile/Email identity. YouTube is investigating the issue. 1. Keep switching your channel identity at www.youtube.com/channel_switcher or by clicking "Switch accounts" after clicking your avatar. Yes YouTube is definitely working on the problem where it spontaneously switches back to your G+ Profile/email identity from your main channel identity. Unfortunately I don't know how long it may be before there is a fix. Quite honestly I think google is pretty stupid for thinking that anyone wants to use Google+ still... No one uses it. Why force your users to be a part of something that just pisses them off... Google rocks at everything else but they absolutely ruined youtube for me. I have to use extensions to make it perform the way it should, 1/3rd of all the videos I try to watch get that static screen either says undefined or theres a problem, so many things wrong with it and its gotten a lot worse this year. It really shouldn't be that hard to make youtube pleasurable because they can manage to do much more complex designs, look at the new google maps, thats miles ahead of the old one, youtube should NOT be that hard fix. They are not working on this problem otherwise it would be fixed by now. They're desperately clinging to the idea that people want to use Google+, wake up google. Ugh.